I had a really long post, but the internet ate it. This book has a bunch of generic monster hunting stuff which would be useful for most characters, which is alright. It has trophy rules and an Occultist archetype that uses them. These rules are very general, and are closely related to the Wondrous Item crafting rules. It has some feats for outdoorsy types (the almost tactician for hunters seems alright). It has an inquisitor archetype (actually decent if you're in the right campaign) and a druid archetype (average) for fighting aberrations. It has a druid archetype and a bard archetype for fighting fey, both could probably be decent in a mostly fey campaign. It has an unarmed combat style based around intercepting and grabbing foes, a feat that allows for combat relevant wild empathy, and two useless rouge talents. It has a weird archetype for alchemists that downgrades bombs slightly (dot instead of aoe splash, acid damage only), that instead of getting brew potion can harvest goop from a dead ooze to make a better bomb. While this is a cool idea, the CR limitation of the bottled ooze extract ameks this ability super unreliable for players. The name is obnoxiously misleading. It has a bad paladin archetype for fighting outsiders, and three legitimately good feats vaguely related to fighting outsiders. an archetype and an Order. The Order is alright, but the archetype is terrible. A small bonus to AC vs large creatures is not worth trading in your mount. It has some feats for specific favored enemies that are actually decent, trying to incentive rangers to have a favored enemy other than humanoid (human). It has some magical and non magical gear that is pretty useful, even if none of it is going to change how you play the game or replace the standard kit. It has some spells that seem pretty useful at lower levels, and one single spell that should help any GM having trouble with psychic characters. All in all, most of the archetypes aren't terrible, but they should have either been more specific with stronger/more interesting abilities(the druid archetypes could learn to turn into their enemies or negate some of their more common powers, for example) or more general. The Disciple of the Pike archetype is garbage, and the paladin one is only a bit better. Three stars, minus one because of how much I hate the order of the pike cavalier archetype and the oozemaster archetype. 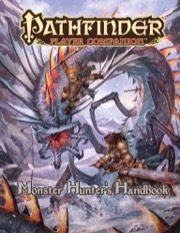 This book unfortunately doesn't have enough unique content in it for em to really justify recommend buying it, as if you really want to do a Monster Hunter style game were you kill and harvest all sorts of different beasties the trophy rules won't cover it, and if you want to fight a specific type of enemy there's better books for that. A lot of the other reviews make a lot of very good points. After reading through it, I do like the number of mechanical options presented, although I do find many of them a bit on the weak side, not particularly useful in many cases, or too specific. The end result being that I'm probably not going to actually using much, if any the material, but it was not outright bad or terrible either. I think my biggest complaint is just how little the different classes, or even general builds actually get here, and that there is just far too much to that could be done, that this book does really even scratch the surface on the subject matter, especially in areas like for fighting Undead or Dragons, that while they have their own books, they likewise just where not enough. Spells where pretty standard for what you would expect. Same with gear. Nothing really jumped out as particularly genius or cool, but likewise was not "meh" or insulting either. I was disappointed how little there was for a "Fey Hunter", really of any build or concept. There is a Bard and a Druid archetype, but that's basically it. Outsider Hunters likewise just felt like it wasn't really touched on much, although the Paladin Archetype looks amazing. The fluff and flavor was readable, but honestly I have very little interest in that aspect of the books, and it, like everything else was just far too little in what it brings to the setting/game considering the focus. 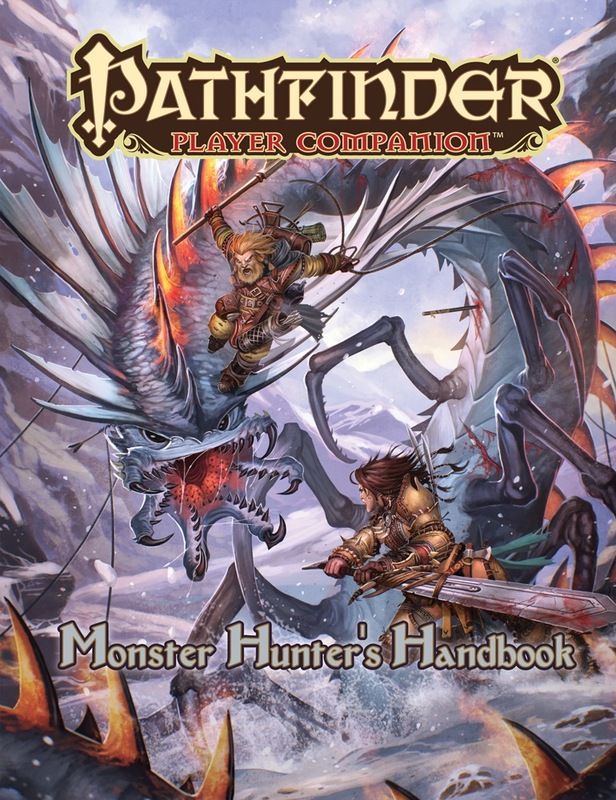 However, as a Pathfinder Player's Guide product, it could have been a lot, lot worse. All in all, it's a nice little item for a quick afternoon read, but not one I would say is essential to play. This book is either gonna be a love it or hate it item, and for me I love it. It contains numerous options for going after different types of creatures as well as advice on how to handle said creature types. Are these options "niche"? For the most part they are but that isn't necessary a bad thing, and the family of feats that gives you a lot of incentive to take a Favored Enemy other than Human are nice. A feat that lets you track with Perception. A feat that lets you use Knowledge skills against their corresponding creatures' stealth and disguise rolls and to track them. I f$!+ing love the Cavalier archetype because it is badass and gets rid of the horsey. I like Cavaliers, but I hate mounted stuff, so this is perfect for me, I can finally play a badass knight that hunts monsters. There's a feat chain that let's you be a skinwalker (not the race, this is more of the I wear your skin to gain your power kind of thing). A magical necklace that alerts you to the presence of the type of creature it is made from and gives different bonuses and abilities against depending on which body part it is made from. A cheap magical whetstone that lets you bypass a certain amount of natural armor and makes your weapon deal more damage. I think the best way to describe this book is "too focused". Not focused in the good way, where there's a strong thematic link between options and everything has a strong idea of what it’s supposed to accomplish, but focused in the same way Weapon Focus or Skill Focus is focused. Far too much of this book only applies against very specific creature types or situations (some of which you can even choose). Almost all the spells are either extremely situational or require you to specify a specific type of creature for the spell to work against, about half of the magic items and mundane equipment only functions against specific creatures chosen at the time of creation, and half of the archetypes become ineffective when not in a campaign that lets them fight very specific enemies. Even some of the options that aren’t super focused aren’t particularly great, like the Disciple of the Pike Cavalier which trades out their mount but for some reason still focuses super hard on charging with a lance/spear, and the vast majority of the feats which are either straight-up bad or just boring and not worth spending a feat on. Even the feats that SHOULD have been cool, like Dimensional Step-Up, completely falls flat outside of very specific circumstances. Tons of them function only if the monster attacking has a specific ability or uses a very specific tactic. Ironically, probably the best feats are the Focused Expertise feats which grant bonuses in every circumstance and grants an IMPROVED bonus against the chosen favored enemy type. Which is really how most of the options in the book should have functioned: grant a bonus that improves under a specific circumstance, not grant a bonus that only exists under a specific circumstance. And speaking of bonuses that only exist under a specific circumstance, let’s talk about the trophy rules. The basic gist is that, after killing a creature, you can take its parts and create items (that fit into magic item slots) that grant you bonuses to a number of stats, and the bonuses increase based on the CR of the killed creature. Sounds pretty great, right? I agree. Oh, also it’s two feats deep into a chain, the first feat of which is really useless unless you’re an Alchemist or can otherwise craft things at super speed before the parts you collect rot into worthlessness. And the trophies themselves only last for a number of days, with a scaling DC which means having something last for a week is high-end skill focus. And the trophies themselves only grant a bonus against creatures of the same type. And if you didn’t craft them yourself (such as killing the creature, giving the bits to the party Wizard to craft, and then putting them on) you gain a reduced bonus and the trophies rot after 24 hours. And, again, they take magic item slots, which means you’re going to have to fight to fit them plus your other gear. Thankfully Monstrous Crafter exists, which can combine trophies with existing magic items and even makes the trophies last forever, right? Wrong. Unlike before the trophy benefits now become 1/day for one minute instead of constant, and it’s 4-5 feats deep since you require Monstrous Crafter, Grisly Ornament, Harvest Parts, Craft Wondrous Item, and (if you’re a non-caster type which is the kind of character that would MOST BENEFIT from the trophies) you also need to take Master Craftsman. At that point it’s half of your feats (or 1/4 of your feats for a Fighter), which is a huge investment for a character to make. There are a few alright options, but it’s the minority in the book. Probably the most worthwhile thing is the Psychodermist, an Occultist archetype that can actually effectively use the incredibly underwhelming new trophy rules, but an entire book isn’t worth one archetype. Avoid this book. I wish I could speak a word of praise about this book. There is none to be said. It is filled cover to cover with terrible, niche rules text that amounts of even more specialized versions of Favored Enemy. If you thought there would be anything groundbreaking, instead of "+1/2/3/4 to X at levels A/B/C/D", "Knowledge Check Untrained, +1/2 level", or "Lose generally useful abilitiy, gain ability that functions only vs X/Y/Z thing or kind of thing", then you will walk away disappointed. The much praised Cavlier Archetype is perhaps the worst offender, as it takes away your mount and forces you to engage in the same gameplay pattern (Übercharger), except without any of the benefits that make mounted charging good to begin with. I am glad I got the PDF copy, because the softcover would have only been useable as very expensive toilet paper. Announced for March! Image and description are not final. Oh!!! Is this a compilation Chris? Or more likely just a hand guide for PCs that don't know why a dragon isn't a lizard? The Hunter/Slayer handbooks are my favorite. This is interesting if only for its extreme broadness. I honestly would have expected something like an aberration hunter book. I was kind of expecting that too. This seems VERY broad, unlike Dragonslayer, Demon Slayer, or Undead Slayer Handbooks. I'll be interested just to see what it has to say about fighting less commonly written about monsters like plants, oozes, and vermin. Well certainly plants. I think the strategy for fighting oozes is "Let the Wizard kill it!" Hmmmmm...I like it. Okay, I will keep my subscription a LITTLE while longer...sigh. Seriously, keep them coming! Great stuff. I'm very curious about what this will have. As others have noted, this is quite a broad subject compared to the other "[Insert creature type] Slayer/Hunter books we've had in the past. Hopefully the final product description will shed some light on what goodies this book contains when it arrives down the line. This one does seem too lack focus with one creature and just went crazy with multiple types. Ooooo maybe it's for playing monsters who ARE hunters? I think of such as guide as "Hunting down your food by Monsters" Rysky. After the one page that says, "Play a Ranger." what will the rest of the filler be? There are Rangers that don't take Favored Enemy (Human)? Screwy rabbit, rangers are for monsters. I think you're mixing your cartoon bunnies there, Mite. No, not really. Humans are bastards, lots of my characters are okay killing them. "you want to know what you need to capture an ooze" sounds good. Capturing monsters and then selling them to fighting arenas is something that i like. I do hope we get a little information on the Hellknight Order of the Pike among other monster-hunting organizations in this book. Hm! Good point Eric! More info on them wouldn't be bad. But I don't think this book would probably cover that in great detail. Agreed on all. Heck, given that their order's weapon is the longspear, a little more information on how to make a spearfighter that can compete feat and damage-wise with the swordswingers would eb vastly appreciated. How about a kineticist feat allow void and wood elements to get a use out of the draining infusion? Also to snuff out a breath weapon, or to track elemental enemies. Also Combat manuever tricks that work vs a creature type. I'd like to see more rope tricks for use against huge monsters. So this will be an inquisitor, ranger, slayer, hunter support book? That's pretty much our guess. It might have fighter stuff too and maybe rogue. But no clear idea yet what's going in. Other than you "kill magical beasts!" probably. Barbarians can shut down arcanists fairly well. I don't see why they shouldn't be able to do the same with magical beasts and the like with a few rage powers in this book. Doesn't matter. Like all Player Companion titles lately: I want it! Hunting Dinosaurs and Dragons?! Sounds like fun to me! 13 Brawler archetypes here please. I wouldn't begrudge a Brawler archetype in this...but any more than that, no thanks. We need more info on this one. It almost sounds like it could be a guide for collecting monsters for a menagerie or zoological park...which would be really cool, IMO. Jurassic Park with Aberrations, Dragons, Magical Beasts, etc in addition to Dinos...FUN! PLEASE PLEASE PLEAAAAASE let there be a skill use or feat that allows you to fight big creatures "Shadow of the Colossus" style! We've always, since 3.0 D&D, lacked some balanced mechanic that allowed characters to climb onto big creatures and heroicly hang on and fight them as seen in so much entertainment media. This product probably already finished and all but if not I want to reiterate how much we need some kind of rule or feat that let's you hang onto large creatures and battle atop them like we see often in anything heroically portrayed in media entertainment. Wasn't there something like that for rogues in the Giant Hunters book? I am still not sure if I will get this one. I will wait when the product updates and decide then. I hope the cover and description are updated soon. I hope the book won't be delayed. Gorbacz, I don't know if you are joking or actually serious for once. Well since this is coming out next month, the product description should be updating in the near future. I am not sold on this one and hope that the update gets me interested.